I’m excited to announce that I have a new book coming out! It’s titled How To: Absurd Scientific Advice for Common Real-World Problems, and it’s an extremely unhelpful guide to solving everyday problems. How To is an instruction manual for taking everyday problems and using science and creative thinking to turn them into much bigger and more exciting problems. It teaches you how to cross a river by boiling it, outlines some of the many uses for lava around the home, and walks you through how to use experimental military research to ensure that your friends will never again ask you to help them move. From changing a lightbulb to throwing a pool party, it describes unusual ways to accomplish common tasks, and analyzes what would happen to you if you tried them. In addition to being a profoundly unhelpful self-help book, it’s an exercise in applying math, science, and research to ordinary problems, and a tour through some of the strange and fun science underlying the world around us. How To will be released on September 3rd, but you can preorder it now from Amazon, Barnes & Noble, Books-A-Million, Indie Bound, and Apple Books. For more, you can check out my Q&A with Entertainment Weekly about the book, and you can find details about foreign editions at xkcd.com/how-to. Sadly, my current Thing Explainer book tour doesn’t stop in the UK (although you can come see me at London’s Royal Institution via live videolink on December 7th—tickets here). However, in lieu of an in-person visit, my publisher and I have put together a special puzzle for UK readers to solve. The puzzle has two steps. Step one is to find out where step two is. For step one, you can pick any one of five cities. Here’s a helpful map, followed by some interesting facts about each city. A major port, built on seven very steep hills, Bristol has long been home to explorers and inventors – and the UK’s oldest dinosaur. In 1497 John Cabot sailed out of Bristol to try to find a better route to Asia and discovered Newfoundland instead. Isambard Kingdom Brunel designed this tall road in 1830. It took another 34 years to finish, and he lived only to see the towers built (one in the suburb the road is named after). A city famous (in song) for its bridges falling down and (in stories) for its streets not being paved with gold. A fifth of all the pieces everything is made of were discovered in London, including hydrogen (originally called ‘inflammable air’) in Clapham, and ten by Humphrey Davy here. There’s even a red world space car in the Science Museum. Inaccurately described by writers as ‘a city of dreaming spires’, Oxford is obsessed with thing explaining. Oxford professors CS Lewis, Tolkien and Lewis Carroll turned Christianity, Anglo Saxon and mathematics into successful works of fiction. This college lays claim to William of Ockham who came up with the principle of Ockham’s razor, that the most straightforward answer is usually the right one. They would all agree that the writing stick is mightier than the sword. Built on an extinct volcano, this city is famous for its body snatchers, for Peter Higgs (big tiny thing hitter) and for Dolly the sheep. Alexander Graham Bell was educated here, and missed it so much when he moved across the Atlantic that he invented the telephone, precursor to the hand computer. The university was founded in 1209 by students on the run from the Oxford police. Home to Isaac Newton, famous for working out colours of light and for understanding how dangerous sitting under an apple tree could be; a descendant of that tree remains near his room. Also home to Stephen Hawking and 89 Nobel prizewinners (31 more than Oxford), and the Mathematical bridge. 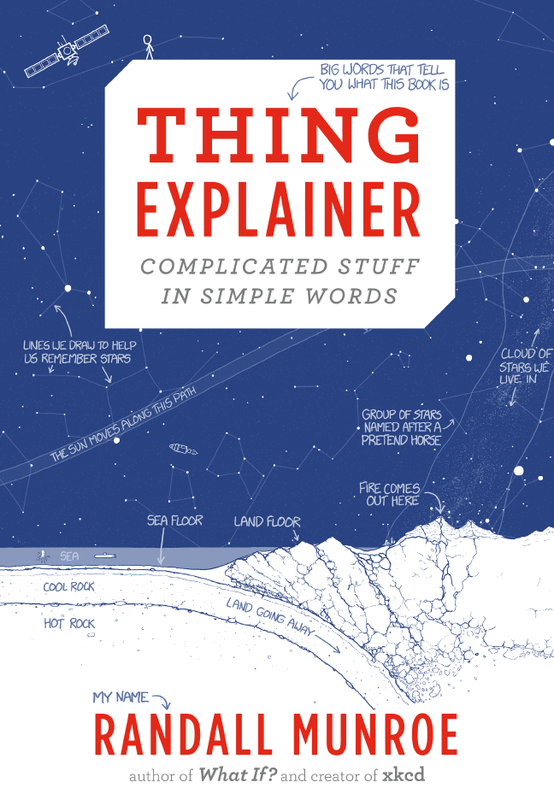 Prizes will include signed copies of Thing Explainer and limited-edition posters and mobiles. There will also be one very special first prize. Those who’ve solved the clue but are unable to get there in person should get in touch at thingexplainer@johnmurrays.co.uk. For updates on the results see @johnmurrays. The results and winners will be announced on www.johnmurraybeagle.co.uk on 7th December 2015. Thing Explainer will be published by Houghton Mifflin Harcourt on November 24th. You can preorder it now (Amazon, Barnes & Noble, Indie Bound, Hudson); click here for links to more information and options. I had a good time drawing Up Goer Five, so I decided to draw more pictures like that and make a book of them. 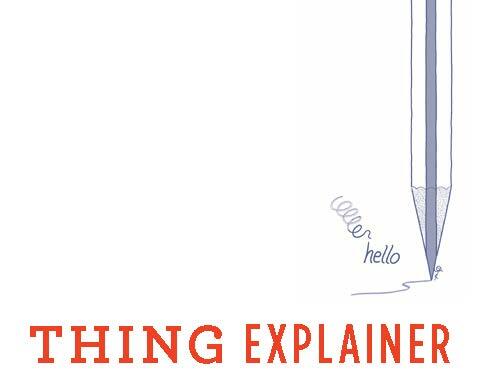 The book explains things, so it’s called Thing Explainer. You can’t have Thing Explainer yet, but if you want, you can order it now, and you’ll get it about a month before the end of the year. Touch these blue words to learn how to get Thing Explainer. My book, What If? : Serious Scientific Answers to Absurd Hypothetical Questions, comes out September 2nd (Pre-order: Amazon, Barnes & Noble, IndieBound), and I’m excited to announce that I’ll be going on a book tour! 6:00pm (Seating is limited) – Note: this event is now sold out! But, you can still pre-order a signed copy (link below). Tickets: $26 tickets on sale August 12 at 9am ET, includes one book, one seat. Pre-order a limited number of signed copies of What If? from Harvard Book Store. Open event, seating is first come first serve. Seating is limited – Note: this event is now sold out! The bar at Public Works will be serving drinks before, during, and after the program. This event is necessarily limited to people 21 and older. Note: Anyone can view the Hangout live on YouTube (Friday, 9/12, 3:30pm PT), but only 4-6 xkcd readers will be selected using this form to participate and ask questions within the Hangout itself. Apply for a chance to participate in the Hangout by Monday, August 25. What if I wrote a book? For the last couple years, I’ve been answering your science questions on What If. 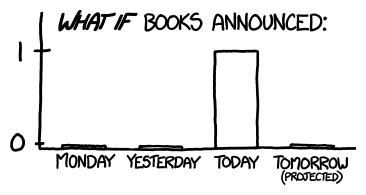 Today, I’m excited to announce that the What If? book is coming! What If? : Serious Scientific Answers to Absurd Hypothetical Questions will be published September 2nd by Houghton Mifflin Harcourt. Starting today you can pre-order it from your favorite bookseller (Barnes & Noble, Amazon, Indie Bound). There are also foreign editions, including a UK and Commonwealth edition and a German edition. Preorder today to get a copy as soon as it comes out! Whoa. There’s an asteroid named after me! Amazing xkcd readers Lewis Hulbert and Jordan Zhu noticed that the International Astronomical Union—the organization in charge of official astronomical naming—was taking suggestions for what to name small Solar System objects. They submitted my name for asteroid (4942) 1987 DU6, and it was subsequently renamed 4942 Munroe. I’m really touched. I spent all weekend telling everyone who wanted to listen (and probably some who didn’t) about the asteroid. 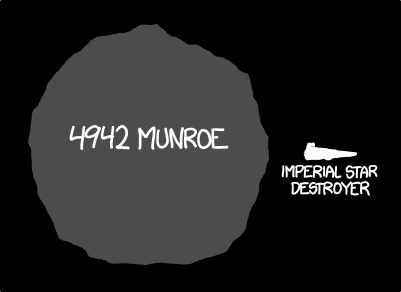 The first thing I did was try to figure out whether 4942 Munroe was big enough to pose a threat to Earth. I was excited to learn that, based on its albedo (brightness), it’s probably about 6-10 kilometers in diameter. That’s comparable in size to the one that killed the dinosaurs—definitely big enough to cause a mass extinction! Unfortunately Fortunately, it’s in a fairly stable circular orbit between Mars and Jupiter, so it’s unlikely to hit the Earth any time soon. 4942 Munroe (!!!) is large enough that it would have noticeable gravity, although not much. If you were walking on the surface and you tripped and fell, it’d take you a minute to hit the ground. You could get into orbit around it by traveling at jogging speed, and might even escape its gravity entirely with a good jump. Thank you so much. This is the coolest thing.